When the mercury dips below freezing, BC locals head for high altitude. 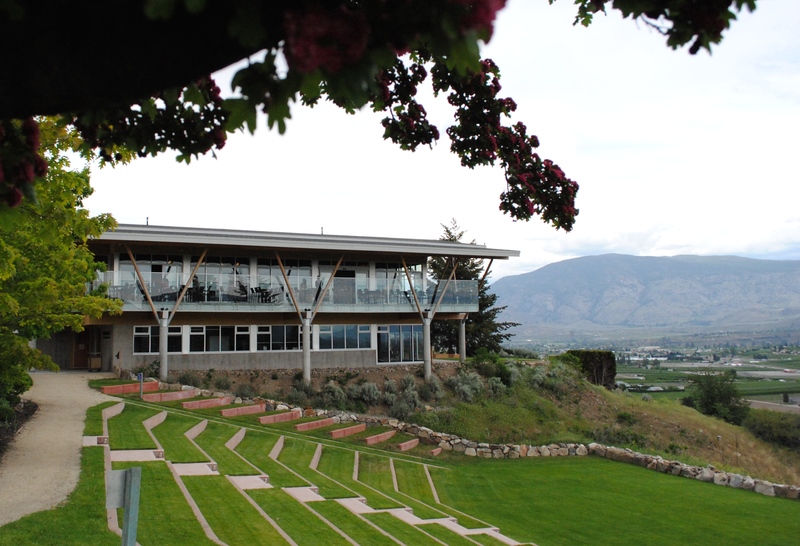 The Okanagan may glitter with sunny beaches and warm lakes in summer, but by winter the locals know to climb up above the valley floor and go to where blue sky days take on a different meaning: deep powder, snow-capped mountains for miles, and après any time of day. 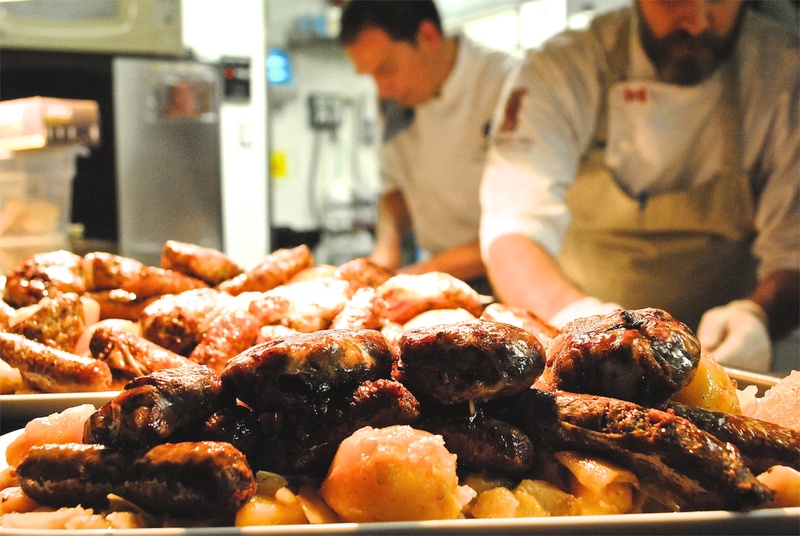 When it comes to food, BC’s Okanagan Valley has something for almost any set of taste buds. 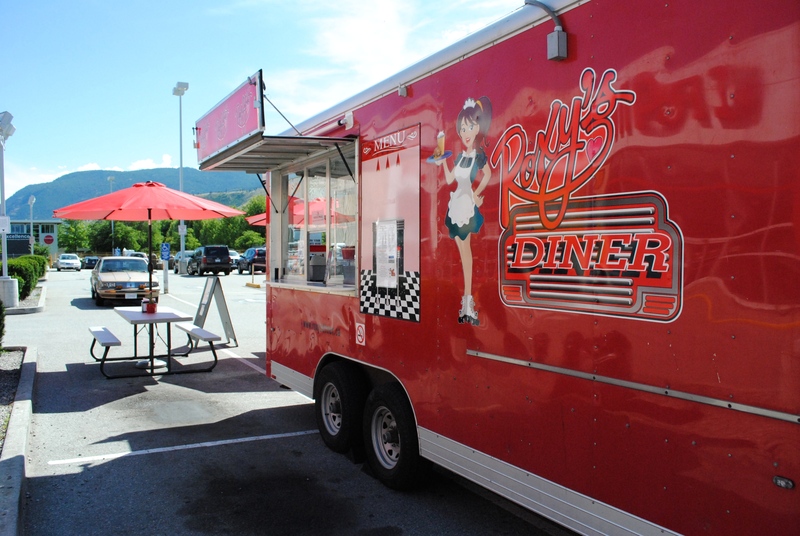 It’s easy to see why chefs flock to the region: the growing season is phenomenal, farms (and farmers) are plentiful, and despite increasing notoriety, the area retains an aw-shucks loveable quality. 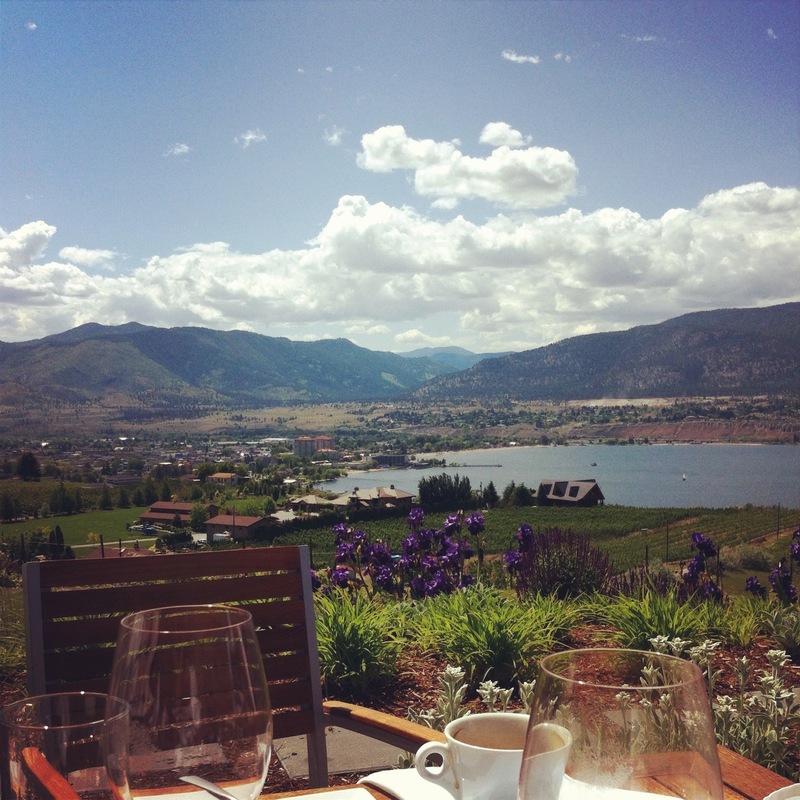 From white table linens and sparkling flatware to roadside take-out joints, there’s no shortage of delicious places to eat in the Okanagan. And there’s more beneath the surface – if you’re willing to look for it. In a world of fast, slow is what we covet. Or should. Go through (if you dare) a fast-food drive-thru and look for the clock/timer near the window; it’s monitoring the entire interaction from the disembodied speaker voice to the person handing over whatever passes for food. It asks that we get out of our cars and take the time to live responsibly, which isn’t a big ask considering that’s exactly what we say we want to do. 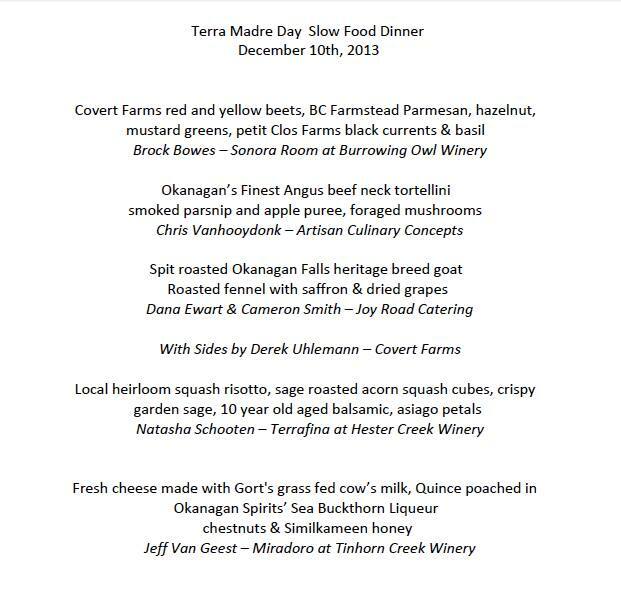 On December 10th I joined 60 people at a Terra Madre dinner hosted by Miradoro Restaurant at Tinhorn Creek. 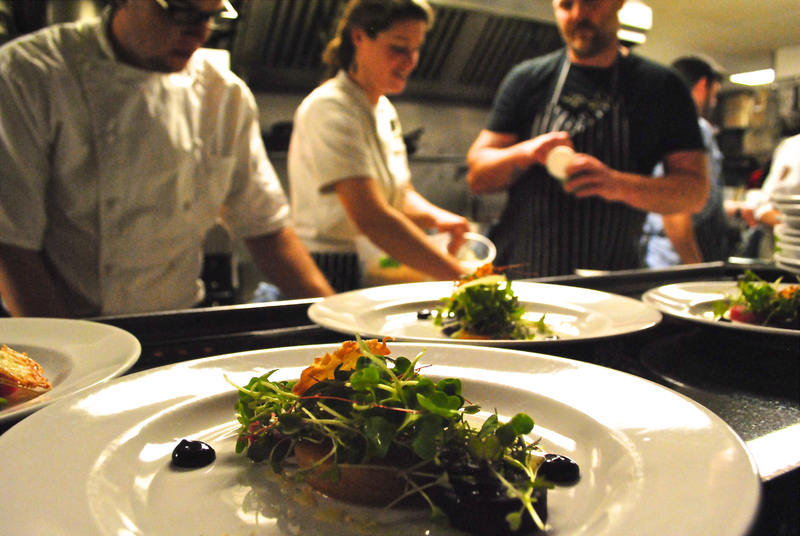 It was part fundraiser for our local Slow Food chapter and part playtime for some of the Okanagan’s most rad chefs involved in the slow food movement and sustainable food sourcing: Jeff Van Geest (host), Dana Ewart and Cameron Smith (Joy Road Catering), Natasha Schooten (Terrafina Restaurant), Chris Van Hooydonk (Artisan Culinary Concepts), Brock Bowes (The Sonora Room at Burrowing Owl), and Derek Uhlemann (Covert Farms). Hell yes, that’s a lineup. 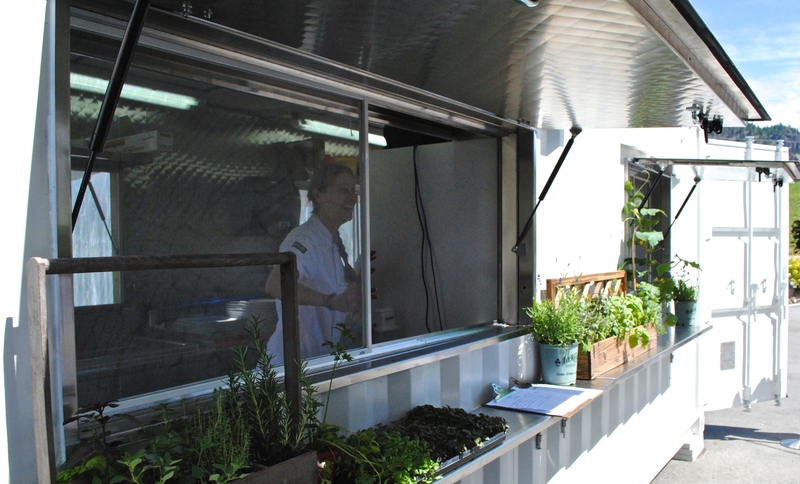 We can talk about being sustainable, eco-friendly, farmers’ markets, foraging, and <insert media buzz word here>. Whether we can support a sustainable food system comes down to how we choose to live and despite what you’ve heard it might not be possible to have it all – if what you want to have isn’t, underneath, sustainable. It took a team of 7 chefs and I have no idea how many others to bring this culinary feast to our table. They spent valuable hours preparing what we consumed. In the type of life that many of us have constructed, that’s not sustainable with our heavy schedules – the work, kids, commuting, home repairs, caring for aging families, and <insert other obligations here>. Or is it? We need to cultivate a new definition of success, one that goes beyond acquisition of X. It’s an entire infrastructure that needs supporting – from how we reward work to what we offer as opportunities to succeed. If we can retrofit a more mindful way of how we live our lives, everyone wins – including what we rely on to sustain us. On a personal note, a hearty and heartfelt thank you to everyone involved in making the Terra Madre day celebration the remarkable experience it was. Each of you rock my world, regularly. Here’s a glimpse of the awesome. 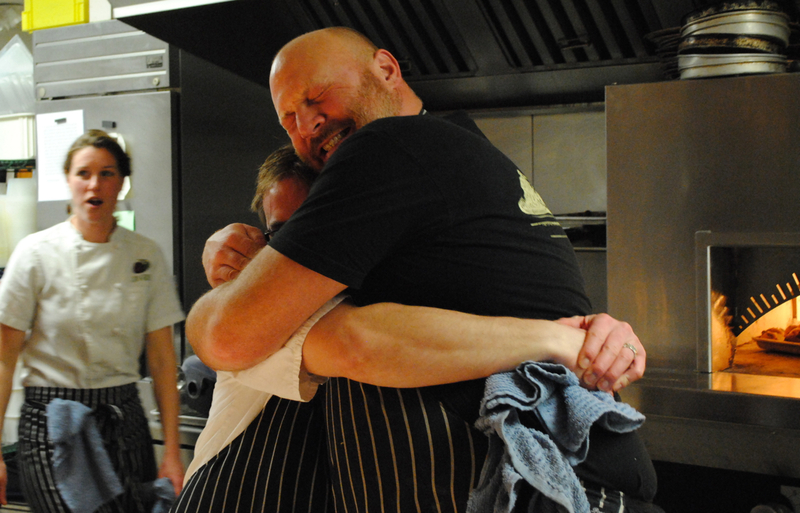 pre-dinner kitchen love: chef Jeff squeezes happiness into chef Chris, while chef Dana looks on – who seems uncertain about what to make of it. 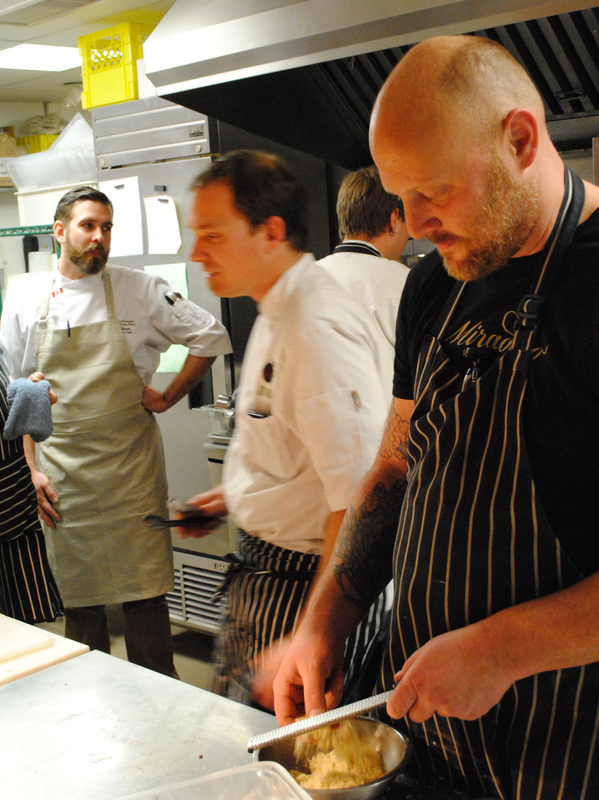 chefs getting down to business: (l-r) Brock, Cam, and Jeff – with Chris in the background. 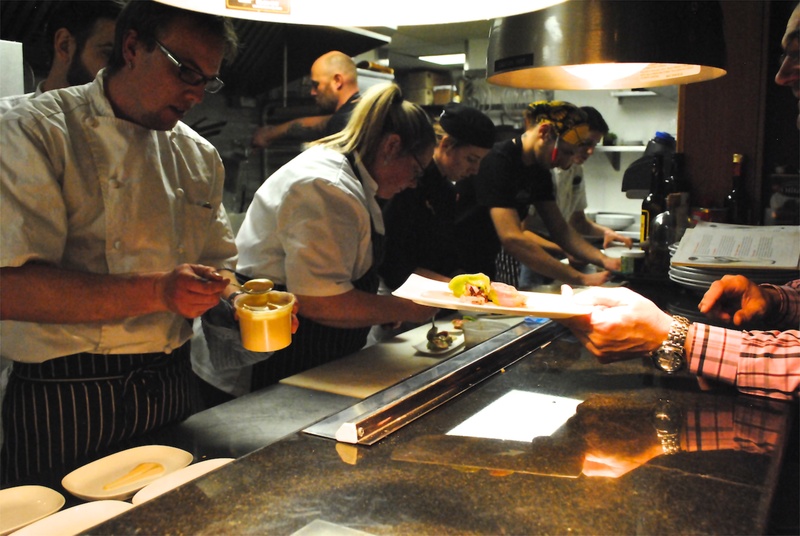 on this night, there is no such thing as too many cooks in the kitchen. it takes a community to feed a, well… community. 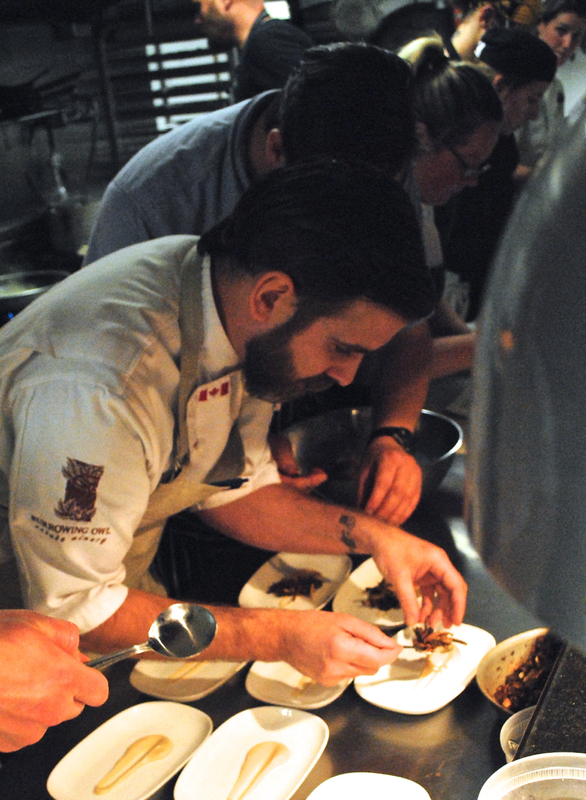 chef Cam carves out a (small) space of his own. that sausage? local goat. 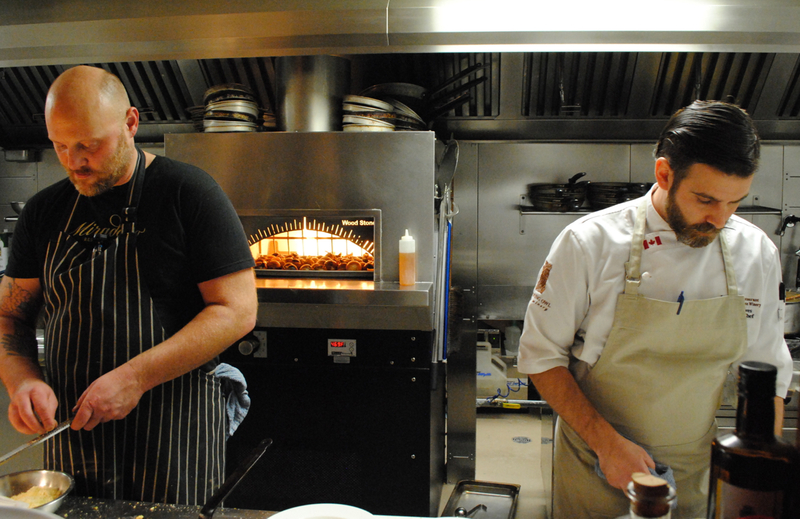 chef Jeff and chef Brock take advantage of a rare spacious moment in the kitchen. the food: magnificent. the people: outstanding. 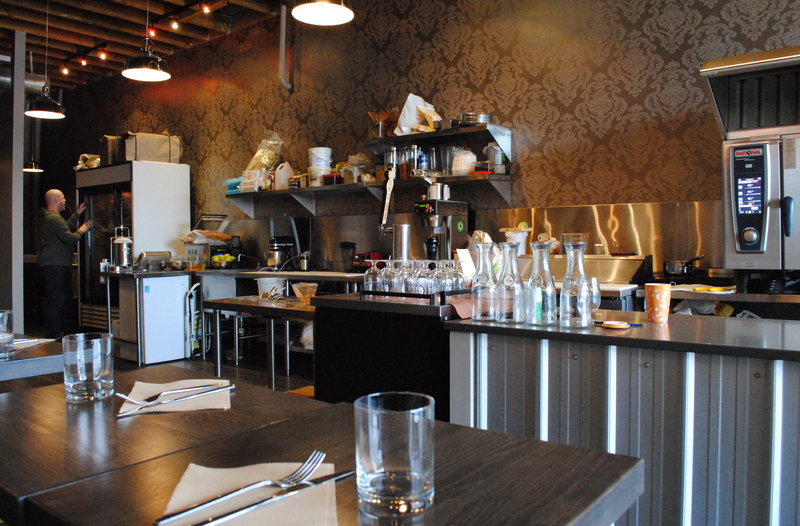 it’s hard to imagine what people in large urban centres do for a culinary experience superior to this. bodies everywhere, producing one brilliant dish after another. 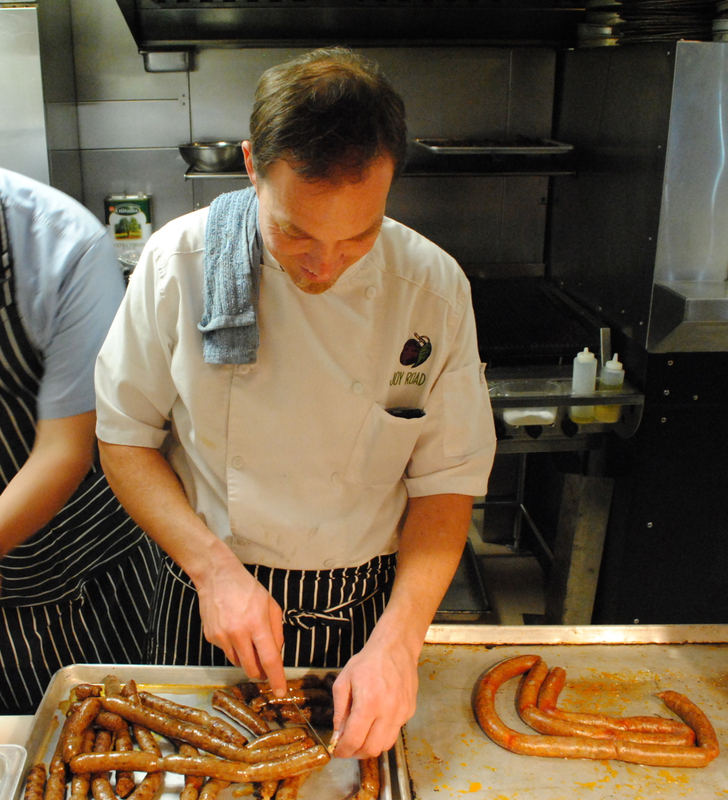 owner Manny waits for chef Chris to put the finishing touches on a plate. local goat, prepared four ways. we happily enjoyed each and every one of them. 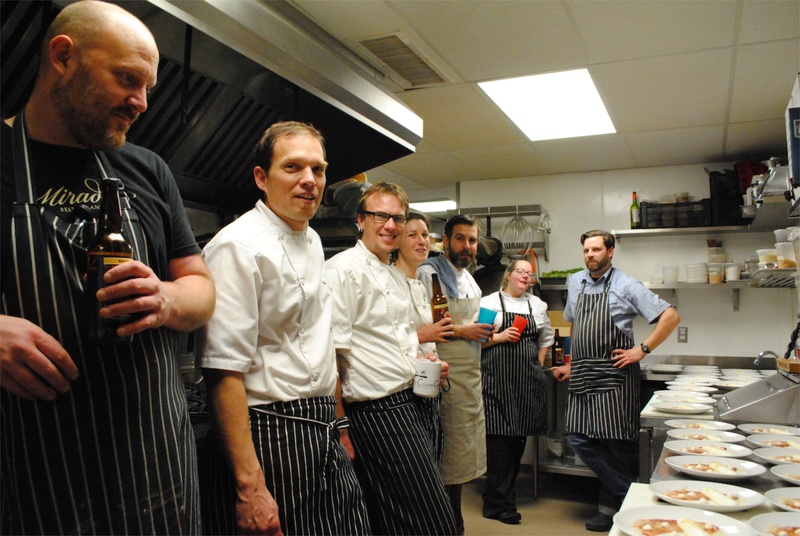 the crew, once the culinary dust had settled (L-R): Chef Jeff Van Geest, Chef Cameron Smith, Chef Chris Van Hooydonk, Chef Dana Ewart, Chef Brock Bowes, Chef Natasha Schooten, and Chef Derek Uhlemann. the menu: ohmygawd the menu.